Resources represent the goods your guest can reserve. They can be rooms, bungalows, scooters, tours, events or even humans. Multiple interchangeable goods should be consolidated in one resource with the respective quantity set. On their administrations page you can add, edit and copy them. It’s also possible to open the normal post view, which can help you to set up multilingual plugins or to define the order of the resources with the page order setting. By clicking on the resources name you’ll come to the resources edit menu. The left side presents you the information’s while the right is to configure it. It starts with the base and children price. They must be a number over 0 and get’s applied once each billing unit. The billing option defines the interval for the billing unit as well as for the availability check in the form, but there’s also the option to calculate the base price only once independent from the duration of a reservation. If the price gets calculated per person the price will get multiplied by the amount of persons that reserves. Persons mean always adults plus children’s. Taxes must be percentage, have a name and can be added unlimited. Anything related to optional services or form fields that have influence on the price can be done with price fields in the forms and not in the resources settings. As next comes the availability section. The resources amount defines how many spaces there are. 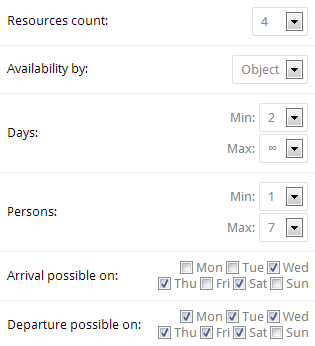 In availability per object that means how many reservations there can be at the same time regardless of the amount of persons. Each space can have its own name, is listed in the overview and you can directly set it for each reservation. In availability by person/adult/child there is not a limit on reservations but how many persons, adults or children can be present at the same time. Further you can configure for how long and for how many persons the resource is available at minimum and maximum and on which days they can arrive and depart. The required permission is only for the administration and defines who can edit the resource and its reservations. For any further and more flexible configuration there’re the filters. How can I restrict the amount of children and adults? They can be restricted by editing the related form fields. How can I order the resources? By default resources get ordered by creation time. If you want to order them manually you have to edit the resource in the post view. There you can set the page order which gets sorted from low to high.